So, in reflecting on the year of 2016 and being a filmmaker, it seems appropriate to talk about the top things I watched this year. Nicole and I (Sean) decided to divvy this up so the movies fell to me. Up front I want to be clear that the following list is not a list of my top films released in 2016. 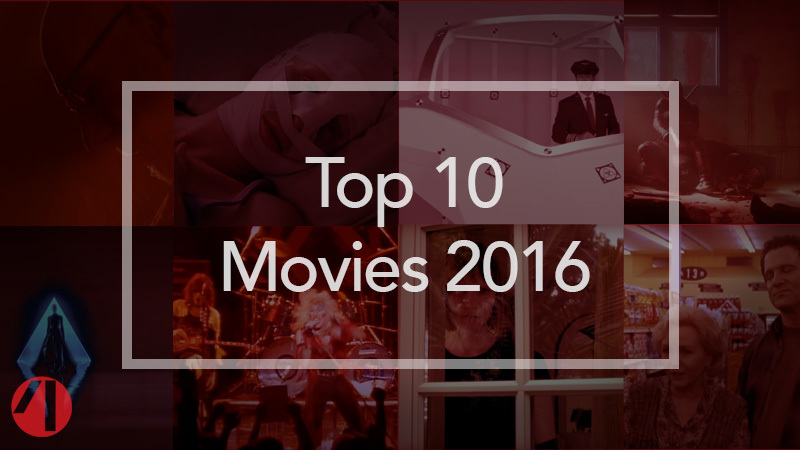 It is a list of my top 10 films I watched for the first time in 2016. Some were released in 2016. Many were not. By my count, and I’m sure I’m missing or forgetting some, I watched 104 movies in 2016. Whittling that list down to 10 was not exactly easy and it’s possible on a different day I may have left others in and some of these out. I enjoy Twisted Sister. Fun band. This documentary covers the years they spent playing clubs and bars and persisting until finally landing a record deal. Whether you enjoy the band or not, it’s an inspirational story for artists about finding your voice and your audience and staying true to that. A great, beautifully shot thriller where figuring out the twist doesn’t ruin it. Another great, beautifully shot thriller. Anton Yelchin does great work in it and I’ll definitely miss being able to see him in future films. Patrick Stewart is terrifying. Not a particularly deep film setting a horror story in the fashion industry, but it’s stylish and was enjoyable and pretty much everything I hoped to get out of a Nicholas Winding Refn film on this topic. Most action movies try to convince you their lead is a badass by having them do some badass thing right up front. John Wick stood out for me because it showed us how scary the character was by making anyone who knew his name very clearly terrified of him. He’s otherwise a pretty standard action movie lead, but more engaging because of how the other characters regard him before he does anything. I was pretty excited when Albert Brooks’ films were added to Netflix. I’ve always enjoyed him. Defending Your Life is a movie I watched again and again when it was on cable when I was a kid. I’d enjoyed him in other films, but hadn’t seen as many of the films he directed. So, as soon as they were available, I watched them and enjoyed them to varying degrees. Honestly, Modern Romance may have been my favorite of the bunch but I decided to highlight Mother and the recently departed Debbie Reynolds instead. I enjoyed the movie fine and though it wasn’t one of my favorites of his, she was definitely a highlight of it. I love Cronenberg. His work has had a strong influence on my own. His films of the early 2000s didn’t grab me as much as his earlier work, but I’ve quite enjoyed his more recent Cosmopolis and last year’s Maps to the Stars. Room shows how versatile a small space can be in a film, and how effective that can be for building tension. In the comics, I don’t actually enjoy reading Deadpool stories (and I read a lot of comics, thank you Marvel Unlimited). I usually find him a bit annoying, but I really enjoyed this movie. The marketing campaign for the film was a delight. The wardrobe department really nailed it with this one. All of the “superhero” costumes felt both like something someone might really be able to wear and like they came from the comics. Much better than every other X-Men film. Funny story about this movie: I was looking for some new sci-fi film to watch on Amazon. I needed something new to feed my brain while I was working on an idea of my own. So, I watched the trailer for this movie and it seemed kind of interesting at first, then that scene where they were shooting an ad with a pilot popped up in the trailer and I recognized it. How did I recognize that? And then I remembered: I was actually on set for that. A friend reached out looking for extras to play film crew in a scene and I had a free day, so I showed up and stood around and looked like a member of a film crew while they shot that scene. If you watch the movie and are looking for me during that scene, you might even see me way in the background (left side of the screen) in the wide shot, or the back of my head in a shot where the whole crew is watching a take. So, this one made the list because I enjoyed it and it was fun to see what the hell that movie was that I showed up for for a couple of hours (I usually don’t ask, I just show up to help, if I can). What were the best movies you saw in 2016? What stood out for you? Leave a comment or yell at me about how I’m wrong about everything on Twitter. I need to check out Maps to the Stars. I didn’t realize there was a new Cronenberg movie! It didn’t get quite as much attention as his other recent films like Cosmopolis, A Dangerous Method, or Eastern Promises, but I think it stands up better than those. Great cast, too.